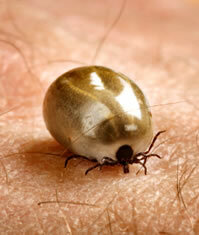 Some people may have contracted the disease through body fluids or from the placenta of their mother's womb or breast milk, rather than a tick bite. This means that the disease may be much more widespread than anticipated. The Lyme organism is highly adaptable and can change from the spirochetal form into encysted form from which they can emerge from the red blood cell when conditions improve. This phenomenon is what makes Lyme disease so difficult to diagnose and treat.